Oregon ranked 6th most innovative state in USA! Massachusetts stole a second straight victory in Bloomberg’s ranking of the most innovative U.S. states, a testament to how much the economy’s wheels are greased by investment in higher education and research. California again scored just behind Massachusetts, which gained ground by churning out more science and engineering graduates and producing jobs in those industries even though it had less technology company density than in 2015, according to the data compiled by Bloomberg. The Bloomberg U.S. 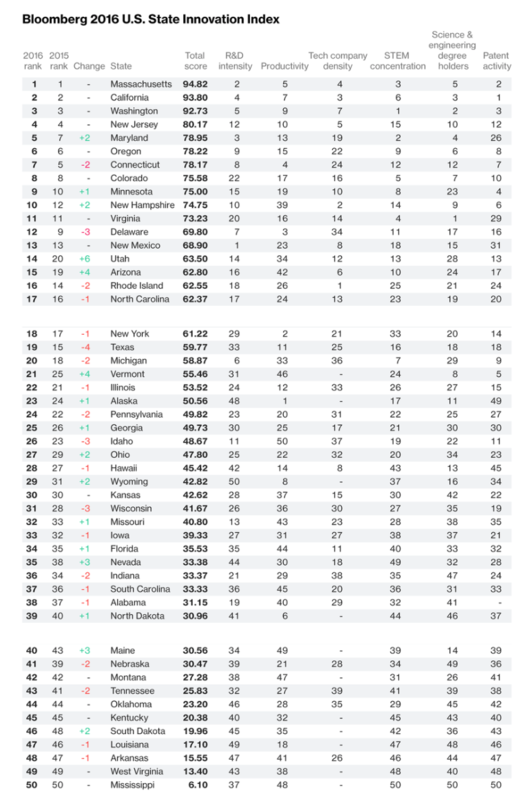 Innovation Index scored each of the 50 states on a 0-100 scale across six equally weighted metrics: R&D intensity; productivity; high-tech density; concentration of science, technology, engineering and mathematics (STEM) employment; science and engineering degree holders; and patent activity. Ranking leader Massachusetts has enjoyed a faster recovery from the last recession than most states and now boasts a 2.9 percent unemployment rate, leaving it tied for second-best in the country. That compares with a 4.6 percent national average. The secret sauce for the state’s innovation is a potent mix of tax incentives to draw in companies, research partnerships between its big-name universities and local businesses, and the transfer of much of that research into patent-able products, said Greg Sullivan, research director at Boston-based Pioneer Institute, a public policy research shop. Washington and New Jersey were Nos. 3 and 4 in the 2016 ranking, while Maryland jumped two spots this year to edge into the top five most innovative states. 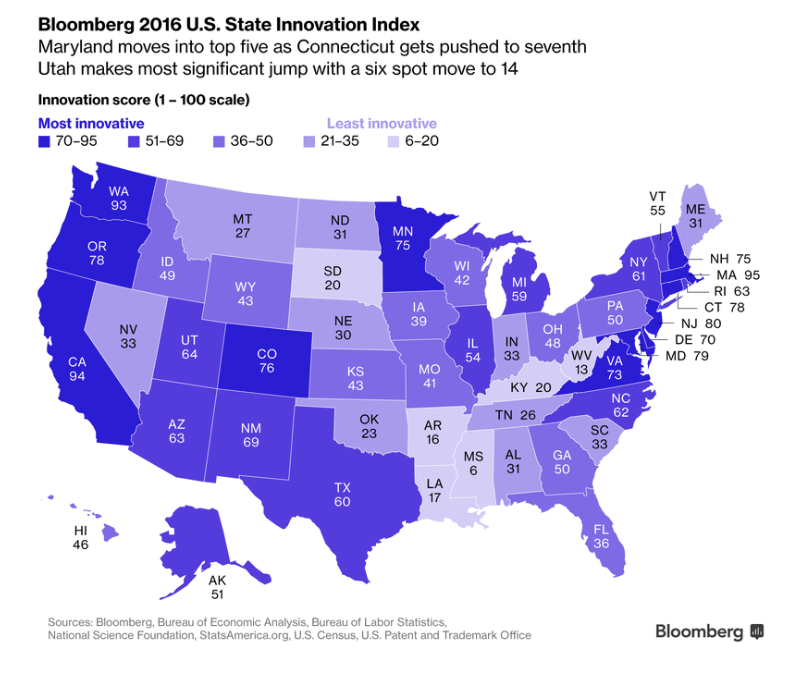 Arkansas, West Virginia and Mississippi are the least innovative in the U.S., the data show. While Silicon Valley lays claim to innovative powerhouses such as Cupertino, California-based Apple Inc. — still the world’s most valuable company — high-tech density in the Bloomberg index is measured by number of companies rather than market capital, rewarding Massachusetts for its breadth over California’s tech giants. General Electric Co.’s announcement earlier this year that it would move its headquarters to Boston amid rancor over tax increases in Connecticut helps to illustrate how Massachusetts widened its lead. Connecticut fell two spots in the ranking to No. 7. “The government’s trying to really be actively engaged in recruiting companies directly, actively, and smartly,” said Sullivan. Utah also was a standout in this years’ rankings, climbing six spots to No. 14, the biggest gain of any state. Its jump owed to a surge in R&D spending. The state’s emphasis on linking education, government and the private sector is starting to pay more dividends for “Silicon Slopes — Silicon Valley with better skiing,” said Val Hale, executive director in the Utah Governor’s Office of Economic Development. Hale credits higher-education institutions such as Brigham Young University with embarking on ambitious research programs, including for cancer treatment. But the state also has focused on earlier stages in the education ladder by setting up internships for high school students at aerospace industry firms such as Boeing Co., which can earn the strongest candidates full-time jobs and even tuition reimbursement. It’s worth noting that to some extent, the data show the limits of measuring healthy innovation. For example, the migration of talent across state lines can be difficult to measure and often captured only on delay, such as through U.S. Census bureau figures.